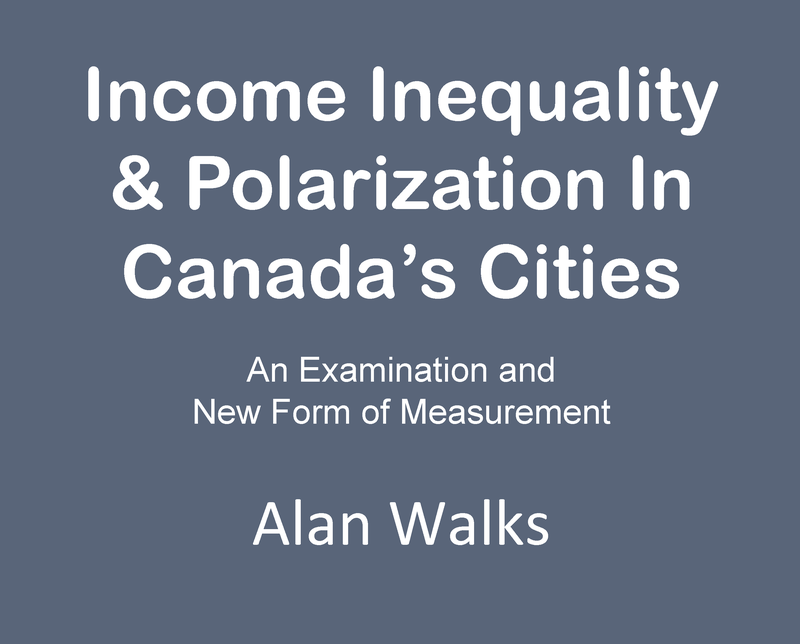 Income Inequality and Polarization in Canada’s Cities: An Examination and New Form of Measurement, by Alan Walks, PhD, Associate Professor, Research Paper 227, Neighbourhood Change Research Partnership, University of Toronto, August 2013. Canadian cities are becoming less equal, and more polarized, at a host of different spatial scales. This report examines changes and trends, 1970 to 2005. The findings show that Canadian metropolitan areas have trended toward greater inequality and polarization over the period, regardless of the index being used, although the trajectories of inequality and polarization show some distinct patterns among metropolitan areas. Inequality and polarization are occurring among all households, among neighbourhoods, and among municipalities. The findings also demonstrate how the properties of the proposed coefficient of polarization make it useful in studies of income polarization, particularly when applied to aggregated spatial units such as neighbourhoods or municipalities, for which the primary existing measures of income polarization are not suitable.